AutoCAD is the hot computer-aided design software known for both its powerful tools and its complexity. AutoCAD 2010 for Dummies is the bestselling guide that walks you through this complicated program so you can build complex 3D technical drawings, edit like a pro, enter new dimensions, and plot with style. AutoCAD 2010 for Dummies helps you navigate the program, use the AutoCAD Design Center, create a basic layout and work with dimension, and put your drawings on the Internet. You’ll soon be setting up the AutoCAD environment, using the AutoCAD Ribbon, creating annotation and dimension drawings, exploring 3D models, and cruising comfortably through AutoCAD 2010. With AutoCAD, the only limits are your imagination. 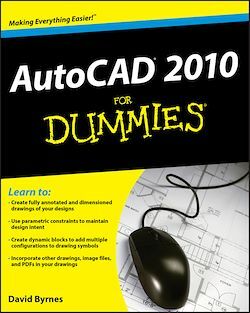 AutoCAD 2010 for Dummies prepares you to use this powerful software to design and document your ideas in 2D and 3D.